The car can handle merging onto the freeway with on-ramps and leaving it with off-ramps, and it can maintain or change lanes. We’d guess this refers to how well the car can keep people alive and not a reference to the auto industry hitting a plateau in lightweighting through materials like aluminum, high-steel, carbon fiber and magnesium. The GS’ driver can turn on the self-driving feature after passing through a tollbooth and reaching a highway on-ramp. The car will drive itself by using”highly accurate” maps and external sensors, Toyota said in a news release. ITS: The bigger near-term collision repair threat? Full self-driving cars will ultimately cap the technology nibbling into collision repair business, but the advances which will produce it will likely do a lot of damage until then. We’ve discussed in detail the very likely possibility that autobraking — in the near future coming standard to more than 50 percent of the U.S. market — will reduce a large amount of rear-ending crash business for auto body shops. However, Toyota also raised the possibility of soon cutting intersection collisions too with its announcement of V2V and V2I communication options on three “Mass-market Models” by the end of the year. Its combination of both is called Intelligent Transportation System Connect, or ITS Connect. 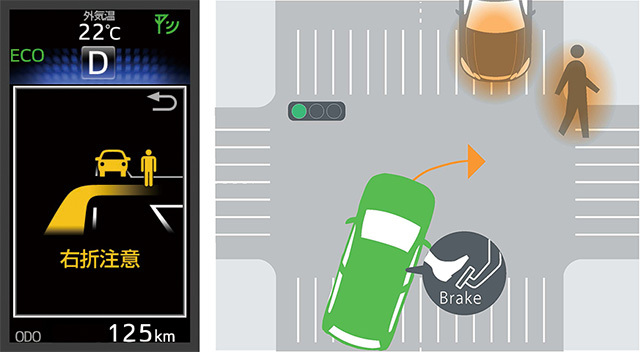 V2V means vehicle-to-vehicle communications — cars talking to each other. V2I refers to vehicle-to-infrastruction conversations — a stoplight talking to a car, for example. Japan has a standardized 760 MHz frequency for these OEM technologies to use. Something like this would have to be established in the U.S. as well or else you’d have a Babel of V2V cars and V2I infrastructure chattering but unable to understand each other. However, automakers likely understand this concern and will develop some sort of standard here as well. And of course, there’d need to be enough cars equipped with the technology, or else you’ll get situations like the Cadillac CT6 having few V2V friends. It’s also unclear how U.S. cities which can’t even pave their roads are going to afford tricking out their red lights and other infrastructure with V2I. However, given the federal interest in reducing crashes, perhaps some sort of grants akin to the Homeland Security spending boom will be forthcoming; there’s also the argument that the V2I systems would pay for themselves with fewer police, fire and paramedic dollars needed for crashes. In Toyota’s case, it plans to “steadily” offer more cars equipped with ITS Connect and likely won’t have a problem with a cutting-edge infrastructure. Toyota also raised the possibility of soon cutting intersection collisions too with its announcement of V2V and V2I communication options on three “Mass-market Models” by the end of the year. Its combination of both is called Intelligent Transportation System Connect, or ITS Connect.